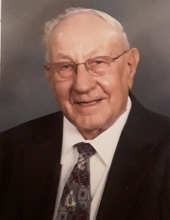 Harold Merlyn Williams, 91, of Bowling Green passed away October 27, 2018 at the Bridge Hospice Care Center in Bowling Green. Merlyn was born February 25, 1927 in McClure, Ohio to Ora and Sadie (Wansetler) Williams. On August 28, 1948 he married Julia (Peterson) Williams. Merlyn was a life long Farmer on his family farm near Tontogany until he retired when he was 79 years old. He was a member of the Haskins Community Church for many years. Merlyn enjoyed camping and watching his grandchildren’s ball games. Merlyn is survived by his daughters Carolyn (Dan) Booth of Grand Rapids, Marilyn (Robert) Cordy of Bowling Green, and Mary (Dennis) Bockbrader of Portage, his grandchildren Scott, Jodi, Jeff, Shelly, Lori, and Jen, 15 great grandchildren and 1 great great grandchild and his brother Robert ( Anna Mae) Williams. He was preceded in death by his wife Julia after 64 years of marriage, his grandchildren Julie and Tom, his great grand children Brad and Andrew, his brothers Emery and Mike, his sisters Berneita and Helene and his parents. Friends and family are invited to a visitation on Wednesday October 31, 2018 from 10 am to 12 noon at the Haskins Community Church, 209 W. Main St. Haskins, Ohio 43525. Funeral services will at be at 12 noon at the church with Pastor Jennifer Jackson officiating. Burial will follow at the Tontogany Cemetery. To leave a donation in Merlyn’s memory please consider the Haskins Community Church or the Bridge Hospice. Merlyn’s services were entrusted to the Peinert Dunn Funeral Home in Tontogany, Ohio. To send flowers or a remembrance gift to the family of Harold Williams, please visit our Tribute Store. "Email Address" would like to share the life celebration of Harold Williams. Click on the "link" to go to share a favorite memory or leave a condolence message for the family.